Hair Extension Caddy and Holder: Joi Mate — Joi Hair - no bad hair days. The Joi mate is the extra set of hands you've been missing when styling your clip-in hair extensions. Styling clip-ins and other types of hair additions can be a challenge. That’s why we’ve created the Joi Mate, so that you can style your extensions with ease and comfort. The Joi Mate has a suction cup that allows for maximum security onto any flat and smooth surface (i.e. bathroom tile, glass). Once you place the hair onto this device, you can style, wash, or store the hair as you wish. 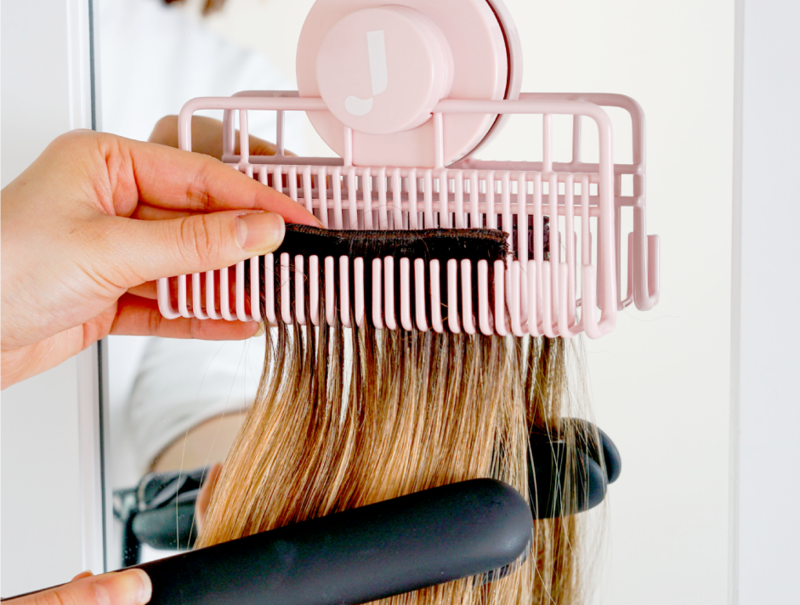 The holding mechanism on the Joi Mate allows for 90° motion which is optimal for blow drying and round brushing. Add the Joi Mate to your hair routine and experience it for yourself. Brush, style and wash your extensions. Rotates up to 90° for optimal styling. Place the Joi Mate on any flat, smooth surface (i.e glass, mirror). Turn the knob where the “J” logo is to the right to tighten. Style as needed. Any hot tool styling, blow drying, or brushing can be easily be done on the Joi Mate. Place hair extension onto the teeth of the Joi Mate. The Joi Mate is compatible for the clip-ins, ponytails, and halos. Turn the knob to the left until it is loosened, then remove the Joi Mate.